If you want to impress your guests at your next dinner party, this recipe is sure to do the trick! It’s a little bit of a project,but they can be completely assembled (including pasta dough resting time) in about two hours. If you don’t feel comfortable making your own pasta, I’m sure that store bought fresh pasta sheets would work just as well, although I have not tried it. The filling is super easy, provided you don’t break any yolks! First, make the pasta. Combine the flour and salt on a clean work surface, gather into a small mound and make a well in the center. Crack the whole eggs and egg yolks into the well and begin stirring with a fork. Gradually stir in the flour from the perimeter of the well until eventually the dough becomes too stiff to stir with the fork. Use your fingers to work the flour into the dough. You may not need all of the flour. Once the dough looks shaggy, clear away all remaining bits, and lightly flour the clean surface. Begin kneading the dough by pushing it away with the heel of your hand, folding it over, giving it a quarter turn, and pushing it away again. Do this for about 5 minutes. If the dough feels sticky when you press your finger into it, dust a little more flour on the dough and continue kneading. Knead the dough another few minutes until if feels somewhat soft to the touch. Dust with flour and wrap in plastic or a towel, and let rest for 30 minutes. While the pasta dough is resting, make the ricotta filling. Place the ricotta, lemon zest, salt, pepper, and 4 egg yolks in a bowl and stir well to combine. Refrigerate until you are ready to start filling the ravioli. Once your pasta dough is ready, cut the dough in half, keeping one half wrapped up. I use the kitchen aid pasta attachment, but the hand crank pasta maker works just as well. Flatten the pasta half with your hand to make it a little easier to squeeze into the machine. Set your pasta maker to widest setting and run the dough through, flouring the dough if necessary. Run it through the widest setting a second time. Repeat this process on the next setting, running the dough through twice. Continue gradually going thinner and thinner until you can see through the dough, but it’s still thick enough to hold your ravioli filling. I find that setting 6 or 7 is usually thin enough. Lay the dough strip out on the surface and cut out 4″x4″ squares of dough. Keep the squares covered with a damp cloth to keep them from drying out. Line a half sheet pan with parchment paper and dust with semolina flour. Lay out half of your squares (you should have at least twelve squares from the first half of pasta dough), and mound about 2 1/2 tablespoons of the ricotta mixture onto each square. 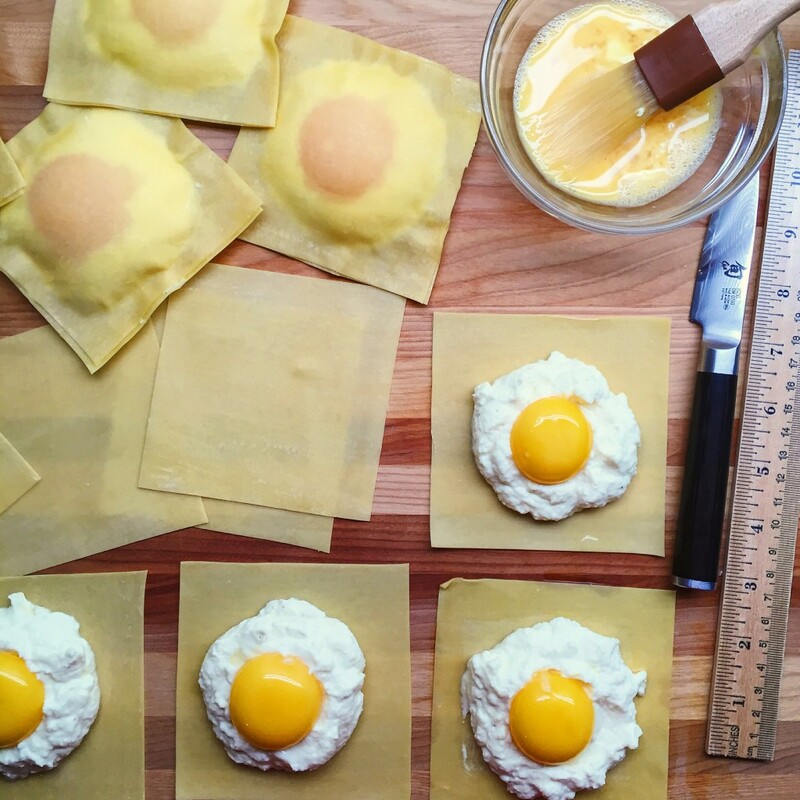 Make a well in each ricotta mound and carefully place an egg yolk into each well. Brush the border of each with the egg wash and top with the remaining squares, pressing to seal. Lay the finished ravioli on the prepared sheet pan. Repeat with the remaining half of the pasta dough, making twelve ravioli. At this point, you can refrigerate the ravioli for up to 4 hours. To cook, simply bring a large skillet of water to a simmer. Slide the ravioli (in batches) into the water (yolk side up) and simmer for 3 minutes. Do not flip the raviolis. Remove from skillet and serve with your favorite sauce. I have made these with a brown butter and sage sauce as well as a butter and truffle oil sauce. Both were delicious! These ravioli look gorgeous! Does the yolk stay fairly runny when cooked? Thanks! Yes, the yolks remain perfectly runny. I wish you could hear the sound my stomach just made as I finished reading this. Recipe looks absolutely delicious, I’ll be sure to give this a try!